The public's trust in, perception and understanding of science seems to be eroding, according to popular media and some recent studies, but little is known about what may be driving that change. Researchers culled data from 2011, 2014 and 2015 Nebraska Annual Social Indicators Surveys, which had asked questions relating to such topics as evolution, disease, microbes, vaccinations, science identity and scientific curiosity, among others. Joseph Jochman, lead author of the paper and doctoral candidate in sociology, said the most salient effects of religious affiliation were found regarding scientific knowledge. "In line with past studies, we found certain science knowledge questions have strong religious associations," Jochman said. "People of conservative Protestant faiths tend to answer questions such as humans and apes share a common ancestor or death is a part of the biology of life with less accuracy than people who identify as mainline Protestant, Catholic or other religious faiths or no religion." Political affiliation associations with scientific knowledge were split on specific topics. For example, liberals in Nebraska were more than four times as likely to answer accurately how vaccinations work than conservatives, but those with other political ideologies were less likely to answer accurately that a vaccine helps rather than harms. On the flip side, conservatives were more likely to answer accurately that disease can result from interactions between genes and environment. "The results show a very complicated picture, but that's understandable because science is many different facets," Jochman said. "As do religion or politics." Julia McQuillan, professor of sociology and co-author of the paper, said the results demonstrate that science has been politicized. "Scientists hope that science is apolitical," she said. "But we take in and code information based on our perspectives – including political ideology and religious beliefs." McQuillan said the communicating scientific knowledge to the public is increasingly important, but that this research demonstrates the need for scientists to be aware of predispositions and biases in the audiences with whom they are communicating. "People do have these filters and if we want to share evidence-based information, we need to pay attention to those filters, often based in religion and politics," she said. 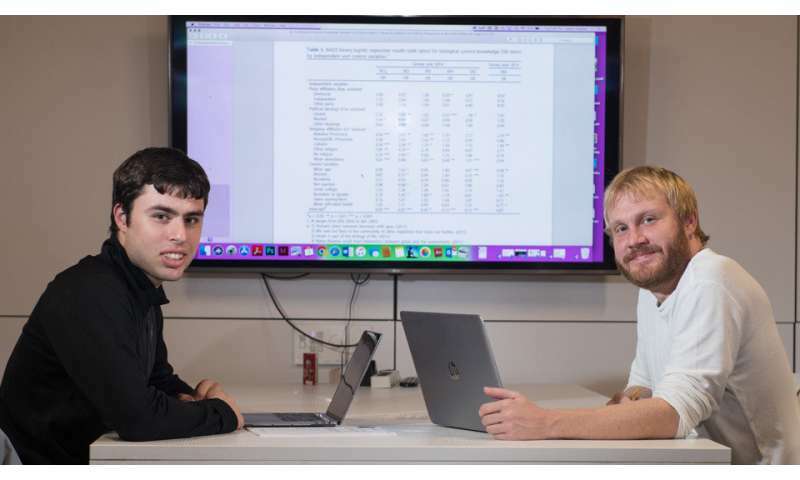 The study was also authored by Alexis Swendener, a recent doctorate in sociology, and Luke Novack, a senior majoring in sociology and biology. Among other things, answer questions with "less accuracy"? Meaning, answer questions less in line with the dogma the "scientists" insist on. Galileo was not accepting of the unquestioned philosophies of his day, but is respected now. Alfred Wegener said continents move and no one believed him. East European women practiced inoculation before Jenner proposed vaccination. Saying death is a part of the biology of life sounds like trying to convince the gullible that death is necessarily inevitable. Note the playing with words, saying "vaccines don't cause harm". Vaccines should not cause harm, but what they dispense today are not vaccines! They also have powerful chemicals! Colorations alone in some medications can cause serious reactions! And note the discovery that a "peer reviewed" article on "climate change" was wrong. And billions of dollars in projects are based on the unproved claim that blacks are necessarily the same as whites. What a missed opportunity of properly interpreting the findings. What they really tell us is, that beliefs in a dogma, be that religious or a political party worldview, cut us off from reality, force us to mentally censor what we read, see and otherwise witness in nature and life. They make us like Julian believers in overpopulation and resulting overexploitation of our planet incl. climate damage not happening, because Church officials preach that all what counts are the more the better believers. More followers mean more profit and power for the cult.